-->> (( big scan big scan !! ))..
..i only recall two specifically T.V. guide spots form the early '90s.. The famous one with the Movie Guys from TMNT II and Barbara Walters. Also one with the Turtles and a bunch of other cartoon characters. I think Bart Simpson was among them. 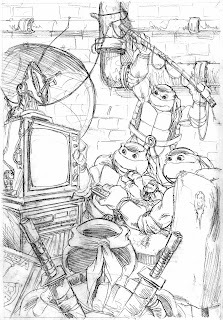 This one reminds me so much of he art on the old Archie TMNT A Digests. Hello Peter! I love your artwork. I especially love how you drew the first original comic turtles, so realistic and like what a Teenage Mutant Ninja Turtle would look like. I actually have an autograph of yours from the Ninja Turtles art contest that's on ninjaturtles.com that i won a couple of weeks ago. I don't know if you remember but you signed it with a ninja turtle head that had a speech bubble that said "Congrats Greg!" Gosh I love looking at that thing. 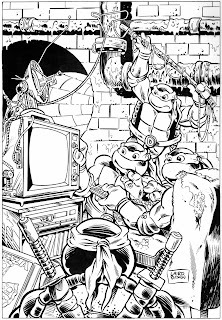 But I do have a question: I am a rising artist, and I would like to see some tutorails on how to draw the first original comic TMNT. May you please post some tutorail pages on your blog? I would love that! Awesome! Your pencils and Ryan Brown's inks are unstoppable! What goes into inking these pieces that the original drawing remains unchanged. So, think ink isn't done directly to the original drawing? I just wanted to add one comment concerning what was said in the last thread about Murphy's 5th turtle blog. If Murph has lost interest in it, maybe someone else at Mirage would like to pick up the slack? Didin't Lawson or someone else there take care of that blog originally anyway? hey Mr. Laird, I love reading your blog. it's really cool to see so much of your unseen artwork. I was wondering if you have an email in which you can be reached? I have something to ask and I prefer it not be posted in public... thanks and take care"
Heh, I just love that Don is doing something a tad lo tech in order to get better reception :). Peter, I've been working on these things for the past 10 years or so, trying to learn various 3D programs...as working on my own stuff is a tad nerve wracking seeing as how I'm a perfectionist. -->> DAMM , Neil !! Any chance these might be usable in the 25th anniversary campaign somehow? They'd only require minor touching up by a real artist in the skinning department..."